The edict is simple: to explore strange new worlds, to seek out new life and new civilizations, to boldly go where no man has gone before. And while that is coincidentally the elevator pitch for J.J. Abram’s soon-to-be released Star Trek summer movie franchise, it’s also the modus operandi of NASA’s new Kepler Space Telescope. Named after 17th century German astronomer, astrologer and mathematician Johannes Kepler, who is best known for his eponymous laws of planetary motion, (although we’re fans of his first and more ominously titled work “Mysterium Cosmographicum”) the Kepler spacecraft is set to orbit the Sun in search of Earth-like planets. Interestingly enough, while the last few weeks has brought a torrent of articles conjecturing the probable existence of literally billions of Earth-like planets in our galaxy alone, the actual existence of a planet outside of our own solar system wasn’t confirmed until 1995. Now, with the possibility of some sort of world-ending calamity taking place on-or-around December 21st, 2012, and the fact that just last week, another Tunguska-sized asteroid buzzed the Earth, locating an inhabitable planet we can relocate to might turn out to be less a scientific luxury, and more a civilization-preserving necessity. 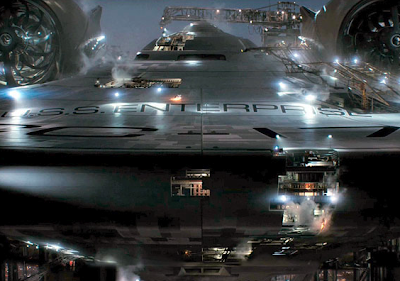 In the meantime, we can’t wait to “boldly go” see Abrams ’ refurbished Enterprise.